The Equal Employment Opportunity Commission published its first look into sexual harassment data for the year 2018. What they found were some pretty disturbing results. Workplace harassment is such a big problem that the EEOC have set up their own specialized task force to deal with it. A 12% rise in successful cases is estimated to cost around $70 million a year… and times are only getting worse. Just how Bad is Sexual Harassment in the Workplace? According to the EEOC they have filed twice as many reports as they had at this time last year, some of which lead to prosecution or an average settlement cost of $125,000. As you can imagine, the legal fees alone are enough to warrant a cold sweat from most employers. The report then went on to outline some key risk factors involved with sexual harassment claims and gave us some good insights as to how to avoid them: but let’s not forget that regular training is the leading deterrent in this area. There are several risk factors involved in sexual harassment cases. Avoiding a fully male dominated working environment is encouraged as a first step towards eliminating some of these risks. Cultural and language differences between groups of employees are also likely targets for harassment to occur and should be closely monitored. The report further advises that employers should be aware of the disparities between their employees and how these levels of corporate structure can affect morale and self-esteem. Isolation is another risk factor, as are workplaces where monotony is the norm as is any job where employees results are based on client satisfaction. There was a final identified risk and one that we can all be aware of in the coming years. There is a stigma towards younger workers at the moment as their generation has been branded as ‘lazy’. This group are particularly susceptible to social interactions with other members of staff outside the workplace and represent a group threat in terms of endangerment. Encourage respect inside and outside of the workplace in order to tackle any issues with this group before they begin. Training is vital in this respect as it will enlighten them what is and isn’t acceptable at the office or when socializing with office colleagues. As you can imagine, there are very few employers in the world who cherish having a sexual harassment charge filed against them or their company, so going out of your way to prevent these things before they happen is the best course of action. One of the best things you can do to avoid issues building to breaking point and to nip problems before they bloom is to encourage use of your open doors and your independent employee hotline. The institution of a safe and confidential hotline where employees can report such matters in confidence will ultimately save them from having to go through sexual harassment on their own. Of course, as a double benefit a hotline will go a long way to protecting your assets as well. If you can be shown to be actively fighting back against Sexual Harassment and if you can support the victims and punish the wrongdoer’s before it goes any farther then you will save yourself time, money and energy… not to mention the stress. 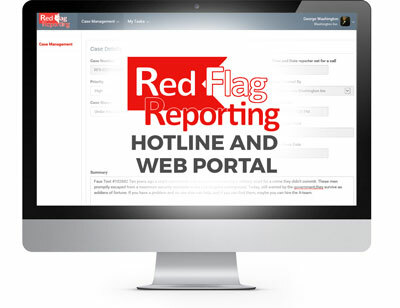 If you would like more information on how to get started hiring a hotline of your own then visit Red Flag Reporting, the hotline service that could save you from a lawsuit.